I'm still working on the upgrade and yesterday I finally saw some brighter lights at the end of the tunnel for the new standalone quizzer. I had the quiz portion done and decided to add a test tab to the mix. As usual it required some reworking, sometimes called refactoring. This is a fancy term for tons of work and you end up where you started. It is a common thing in programming, but sometimes you paint yourself into a corner and the only way to get out of the room is to repaint it so you can move on to painting some new rooms. I completed that last week and have made great forward progress again this week. I did spend a couple of days chasing down a print problem. The first problem had to do with the file name being too long, the second was a formatting error on the blanks USA paper style with the Gutter. It was offset on the page. It has been a long long time since anyone reported a bug in Memorize-It so fixing this took a lot of extra work. The 5.0 version got dropped in 2005 because of a family emergency. When I came back to it last year the compiler I was using was no longer going to be usable. I made a huge shift to a new build environment and continued on. This meant that I had also left the 4.0 version stranded. In order to work on this print problem I had to bring it into the new build environment as well. This was a two day ordeal. When I finally got that working and started adding some instrumentation to the print process I found what I think was the problem. I'm still waiting to hear back if this fixed the problem for the user. So what does this all mean to you? 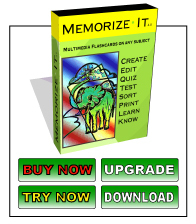 If you purchase Memorize-It and find a problem that can be fixed. I drop what I'm doing and fix it. If I can't fix it or you are just unhappy about the purchase, I refund your purchase. I'm in this to help you study. I squeeze my expenses so I make a little bit on it each year (a few hundred dollars), but what I really like is to hear that this helped you in some way.